Issuing an extraordinary gazette, President Maithripala Sirisena prorogued Parliament with effect from Thursday midnight. 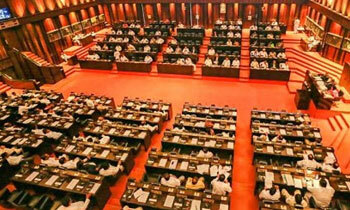 The next Parliament session would be commenced on May 8. The prorogation is the period between the end of a Parliament session and the opening of the next Parliament session. During a prorogation, no motions or questions can be tabled in Parliament. It brings nearly all parliamentary business to an end. The Parliament was prorogued for the last time on May 17, 2009. He has run out of options so he need some time to come up with some new crap. Democracy? What Democracy? I think the hon members we selected need a break. Interesting call but why ??? So that they could all go off and have a good holiday? LIterally everyone at the Diyawanna has gone overseas..
People know the Govt is Pro-Rogues. The best that MY3 can do for the country is to prorogue it for eternity. Nothing constructive ever comes out of the 225 inside it except to burden the poor further. Disolve the parliment now. Let there be a clear winner in the next vote. He is good at this type of nonsense.has done nothing to the country. He has prorogued because he has no control over his own flock. Rather than attacking the rogues he is on war parth with Ranil. IT IS REAL THREAT OF PARLIAMENT DEMOCRACY. THIS POWER MUST BE ABOLISHED. IN THIS COUNTRY PRESIDENT IS BEING RESPECTED BY THIS COUNTRYMEN NEXT TO ING OF DEMOCRACY, THAT IS THE REASON WE ALWAYS CALLED HIS AS HIS EXCELLENCY. BUT WE EXPECT SIMPLE EXPLANATION FROM HIS ACTION ON PARLIAMENT MATTER. I initially read it as "Parliament is Pro Rouges"
With nothing going for the President these days, this is perhaps one way of making his presence felt.